Outhouse Theatre Co, in association with Redline, presents, THE ALIENS, by Annie Baker, at the Old Fitz Theatre, Woolloomooloo, 25 August - 19 September, 2015. Annie Baker's 2010 play, THE ALIENS, is set in a fictional place called Shirley, in the state of Vermont. Two older men (early 30's) in the backyard of a coffee shop befriend a young worker of the shop, and share their ambitions and observations of life. It is part of a collection of plays, four in total, set in Shirley, Vermont, the others being: CIRCLE MIRROR TRANSFORMATION (2009) - produced by the Ensemble Theatre, in August, 2010 -, NOCTURAMA (2010), and BODY AWARENESS (2008). These plays have been published as THE VERMONT PLAYS, and, most have been prize winning. In 2013, THE FLICK, by Ms Baker, was produced, and is the winner of the 2014 Pulitzer Prize (now in an extended season at the The Barrow Street Theatre, Off-Broadway - until early January, 2016), whilst late last month, her new play, JOHN, premiered in New York, at the Signature Theatre, to glowing reviews. Life unfolded in such frank simplicity that the auditors seemed almost embarrassed to be present; it was as if they eavesdropped behind a door or peeped through a window. As you know, there is no heroism of any kind in the play, no stormy theatrical experiences, no lurid spots to evoke sympathy, such spots as usually serve the actors to display his talents. Here was nothing but shattered illusions, and tender feelings crushed by contact with rude reality. This description of THE SEAGULL's reception, is an accurate, I feel, truth of the affect that Ms Baker's plays can have - at least on my reading of them, and the imagining of their potential. 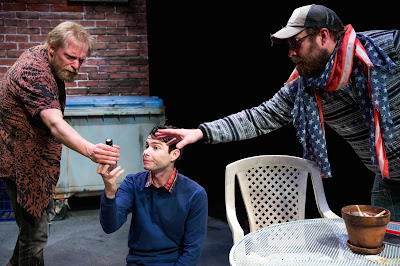 Mr Nathan Heller, in an article in the New Yorker, in 2013 writes, Annie Baker has developed "a style of theatre as untheatrical as possible, while using the tools of the stage to focus audience attention." In THE ALIENS, KJ (Ben Wood) and Jasper (Jeremy Waters), two friends, surviving a failed band, "The Aliens", meet (illegally), in the desolate back patio of a coffee shop in Vermont, decorated with a recycling bin and trash bin. Here, smoking, and blabbing, they 'chew-the-fat', without direction, about their daily aspirations and achievements. Evan (James Bell), a naive, seventeen year old, a new employee of the coffee shop, becomes gradually acquainted with them and later, joins them to celebrate the Fourth of July, with a single sparkler, to the 'orchestra' of the distant sounds of fireworks at a 'main event' in the city. The text of the play is a deliberate drive into the banal, the mundane, with conversations of not much narrative content, but with enormous sub-textual revelation opportunities, and sprinkled with occasional lyrics from their failed songs, and even a reading of part of the novel that Jasper is trying to write in his new enterprise. At the end of the play, young Evan strums on a guitar - a gift from Jasper which Jasper had stolen years past - to, falteringly, sing a folksong, "If I Had A Hammer" - the 1949 Pete Seeger-Lee Hayes song, made famous to my generation by Peter, Paul and Mary in the 'revolting' era of the 1960's - a youthful era of idealistic hopes and aspirations. By the end of the play all this ordinariness has, just as in Chekhov's great works, revealed the extraordinariness of what it is to be alive, to be existing in the tidal pulls of aspiration and love on that journey to the inevitable, unstoppable finish, of all us humans, us aliens (alienated), to a death. What Ms Baker has been honing, over the past eight years (she is only in her mid-thirties), is a style of theatre that defies the urgent need of the 'commercial success', where the product, to capture an audience, has seemed to be, should be, MUST BE: "Bigger, Brighter, Louder". She has been exploring the action of our aspirations, in the 'time' between our words, in our thought gestures, and she insists, in her craft, on the TIME for that to happen. It is what I dub 'slow theatre'. It is the cutting-edge trend of our contemporary theatre: Amy Herzog with her play, 4,000 Miles (2011), and DETROIT (2010), by Lisa D'Amour, are other illustrations of this 'movement' - I observe, all female writers. It is happening even in our cinema: the work of Steve McQueen: HUNGER (2008), SHAME (2011), 12 YEARS A SLAVE (2013) - this 'slow cinema' is what I call, 'Moving Portraiture', the camera capturing the face, the body of the actor, for the audience to read the inner monologue of the narrative, without the support of the spoken word - or, the Turkish Director, Nuri Bilge Ceylan's films: ONCE UPON A TIME IN ANATOLIA (2011) and WINTER SLEEP (2014). Just as in life, Ms Baker, wants the story to be told/acted through thoughts as well as spoken words. Just as famously as Chekhov, Ms Baker asks for the actors to observe Pauses and Silences, in her texts. So, she instructs specifically at the beginning of this published play script: "At least a third - if not half- of this play is silence. Pauses should be at least three seconds long. Silence should be from five to ten seconds. Long Pauses and Long Silences should, of course, be even longer." She asks that at least a third or half the play is to be 'written' by the actors in the Silences, so that they can be read, endowed, by the audience - imagine! Baker takes the extraordinary risk of writing intensive silences into the play - some lasting two or three minutes. The effect is amazing. We seem to be experiencing KJ and Jasper's relationship in real time, not theatrical time at all. As each tiny revelation of character and insight is given, we are allowed ample time to reflect upon it as though we had actually heard it from a personal friend. These characters are so real, so authentic, so true-to-life that I felt as though the playwright had been eavesdropping on my most private conversations with my nearest intimates. A masterpiece. That this 'new' form is working, is exciting, and is a success with audiences, is demonstrated with the growing reputation and expectations of the plays written by Ms Baker. That her past four works have premiered under the Direction of Sam Gold, might also, indicate, that she has found a fellow artist, prepared to trust her as a writer and encourage his actors to enjoy the work that demands a 'naked' revelation of deeply experienced personalised 'truths' in Pauses and Silences indicated in the 'musical scoring' of the play. Today, this process, by Mr Gold and Ms Baker, of attempting to take the theatre experience into an even more explicit 'naturalism' than what Nemirovitch-Danchentko and Stanislavsky achieved, with Chekhov's plays, is as 'radical' as anything else happening at the moment in the theatre, a choice away from other writers' indulgences in post-modernism (or, is it post-post-modernism? ), in reaction from the well made 'commercial' play model - and I, personally, love it. This production of THE ALIENS, at the Old Fitz, has a Director, Craig Baldwin, who does not fully trust his writer to know what she wants/needs to achieve her vision, by not fully observing the written pauses and silences - it does take courage to participate with her vision, the production could become 'boring', especially for the impatient audience/actor or lazy actor/audience - and who cannot resist a flair for personal theatricality ('auteurism), for example, with the interpolation of what I believe is a recording of Charles Bukowski giving a reading of his poem, "BLUEBIRD" during a lengthened scene change, with 'twitching' lighting effects (there are references to the poet in the actual play). I would of thought if Ms Baker wanted to quote Mr Bukowski, she would have, for she seems to know how to write a play and order her material for an audience. This was a Directorial overstatement of what the play is about - other poems are quoted in the program, and I was grateful to have them to read. It seemed, as well, that Mr Baldwin, was unable to advise, direct, two of his leading men to refrain from 'actorly' reactions, a kind of 'melodramatic' exhibition of the usual, self-gratifying motivations/re-actions of characters in the play's situations, and, further, in the case of Mr Wood, as KJ, a tendency to demonstrate an overt sentimentality. Ms Baker, in all her plays, stalwartly, avoids the sentimental gesture - she is, rather, deeply interested in the psychology of her characters, and the way it is 'lived' through by the ordinary man (not an indulgent actor).These characters have no self-pity, rather, having robust glimpses of the worth of 'trying' to 'do', a faint optimism about their lives, no matter the bleakness of their circumstances or prospects of success. The production of this remarkable play is kept afloat with the committed and delicate work of Mr Bell, as Evan. The gentle, nervous naivety, the gently flowering of confidence of the character, as he journeys through the life of the play, underlines, in contrast with the other performers, the kind of choices that can transform this work into a sublime experience of observed humanity. It is the admiration that one may have for the whole of Mr Bell's performance choices that illustrates the 'radical' demands that Ms Baker is making on contemporary actors and audiences. What, at first, may appear as exaggerated, caricatured choices, by Mr Bell, reveal themselves in the observation of his offers over the whole of the play, to be craft of a high order - this is a finely calibrated, thoughtfully wrought performance. The arc of the psychological development of Evan during the final moments of the play as he sings the folksong "If I Had A Hammer", with all of the lyrics owned and clearly delivered for the audience by the actor, accompanied by the subtle sub-textual interrogation of the inner monologue, through voice, and especially body, as revealed by Mr Bell, delivers a wholly satisfying conclusion to the experience of the play. I note that the lyrics -many, unfortunately - and the sub-textual clarity of the 'purpose' of the songs, given to KJ, by Ms Baker, for Mr Wood, are verbally muddy in his delivery technique, and are lacking in any arc of construct, so that the imaginative inner life of KJ is static - where Mr Wood begins, psychologically, when KJ starts to sing, is where he is with KJ when it ends - there is no forward movement of storytelling going on. The magnificent offer that Ms Baker writes, in the 'ladder' speech, in the third scene of the second act, was made comprehensible not by the speaker, Mr Wood, but by the observed thought process of Mr Bell, as the listener. In this scene, then, Evan became more significant then KJ, for Mr Wood did not appear to be able to express the inner journey of the intention of the speech for the audience to be able to read it. The Design work, by Hugh O'Connor, is minutely observed and excellent in its creative input for our belief mechanisms - the details of the weeds sprouting through the ageing concrete, the faded product signage are exemplary decisions increasing the atmospherics of the world of the play, and undelining the principal metaphors of the writing. The Lighting, by Ben Brockman, has real focus, if used too theatrically by the Director. There is no Sound Designer nominated, and part of the problem is the lack of good musical composition to suit the lyrics of the songs of the play to assist Mr Wood. 2) to enjoy the work of a startlingly brave performer, James Bell. But, with the silences of the play mostly shortened, or fudged completely, a great deal of the potential of the play is absent. According to Ms Baker above, maybe a third, even half of the play! Baker handles dialogue beautifully; from bursts of sharply observed slacker-speak to the distinct shades of a 'whatever' or 'cool'. But it's the elongated silences, pregnant and empty, that carry the story and distinguish the script of THE ALIENS. ... Neither of these post-Beckett moderns is going anywhere (they haven't even a Godot to wait for), though some pretty monumental events transpire beneath the static surface. Both KJ and Jasper are damaged goods, which tends to make the many ways which they take care of each other all the more moving. In the underlying kindness of these stunted lives, Baker gives us rays of hope amid bleak prospects. THE ALIENS, a great contemporary piece of writing in a flawed production - adequate only, for me. On the other hand, some believe, good. Certainly, this production does not deliver the "Masterpiece" that Mr Kruger saw in the Bay Area of San Francisco, quoted above. I, sincerely, wish it had.